It would seem "Child 44," based on the trilogy of novels of the same name, has been overlooked and poorly reviewed. And after watching it, it isn't that hard to tell why. The performances are certainly not the problem here, as the likes of Tom Hardy, Gary Oldman, Noomi Rapace, etc., do add something to the film, yet their solid performances are in service of a script that's long and overwrought with enough subplots to push the murder mystery at the heart of the film to the background. The film also wastes such talents as Gary Oldman, Jason Clarke, Vincent Cassel and Charles Dance on small bit parts not worthy of their casting. Notably absent are any actors of Russian heritage, but perhaps that's beside the point. This bloated script can't seem to decide if it wants to be more about the child murder investigation or the rivalry between MGB (the KGB's predecessor) officer Leo (Tom Hardy) and the jealous, villainous Vasili (Joel Kinnamen), not the mention the complicated love life between Raisa (Noomi Rapace) and Leo, or the anti-communist rhetoric. There's also a lengthy diversion about a homophobic witch hunt that's only meant to further the anti-Soviet/communist sentiments that had already been well established by that point. This is one of those novel to film adaptations that failed to find any one particular goal, and opted instead to try to touch on everything at once. A book (in this case 3 books) easily contains more than a 2 hour movie can handle. A good adaptation has to pick and choose which parts to adapt, and which parts to leave on the cutting room floor. 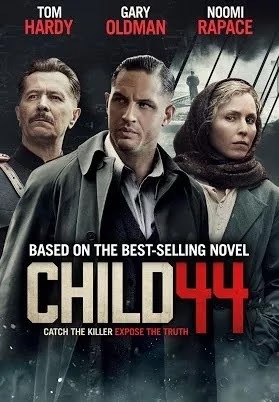 However, "Child 44" makes the mistake of trying instead to pack too much into its runtime. It's a grim world in which the main characters struggle to find people they can trust, and the government can turn on anyone for any reason at any time. Worse yet, once they do turn on someone there's no telling whether they'll just kill them, or take their job and status away only to set them free to fend for themselves. Several characters are killed for their traitorous acts, while others (including the main characters) are given different fates, yet the reasons behind the differing fates are unclear. The two main, warring plotlines follow Leo and his wife as they investigate a series of child murders in the area, and Leo's battle against Vasili who robs him of his job and has him sent away from Moscow. Vasili rises to power by faking reports of traitorous acts by Leo's wife Raisa. Leo must then choose either to denounce her as a traitor or stand by her side and be removed from Moscow, thus forfeiting his lofty title. He, of course, chooses to stay with his wife, but even their love life is a complicated topic that film tries to expound upon. Nevertheless, with Leo and his wife Raisa now denounced and demoted to lowly positions outside of Moscow, they're allowed to concentrate on investigating the child murderer that no one seems to care about. These murders are allowed to continue due to a government that believes their communist peoples are above such a thing. "There's no such thing as murder in paradise." It's false propaganda that the government naively chooses to believe over the truth of the matter. The claim is that murder is a capitalist disease, not something that would befall the people living in a supposed communist "paradise." Worse yet, as facts about the murder come to light, it seems that the government themselves may have been the driving force that produced the murderer. That's where things begin to get interesting as this line between hero and monster starts to become more obscured and Leo is faced with his own demons. Each of these various storylines would have been interesting films on their own. Sadly the fact that they're tossed together in the same film forces neither one of them to be as well fleshed out as they could have been. The two sets of unconnected villains, both of whom we do root against, don't end up as strongly developed as they could have been, had the film chosen one of them rather than both of them. Essentially this is a grim story that lacks cohesion, and that explains the negative reviews, and those negative reviews partially explain the poor box office numbers. The other reason this film bombed so hard is due to the fact that it was pulled from cinemas in Russia, Belarus, Ukraine, Kazakhstan, and Kyrgyzstan for various speculated reasons, meaning their international box office numbers would have been down as well. Their claim was that the film depicts Russians as "physically and morally base sub-humans", also comparing the film's depiction of 1950's Soviet Union to the dark, evil land of Mordor found in J.R.R. Tolkien's Lord of the Rings. "Child 44" certainly had potential, but ultimately ends up as a blip in the careers of some great actors. Their performances are good, the film is not. While, we're making Tolkien references, this film is the opposite of the way Bilbo the Hobbit described himself, after years of prolonged life due to the ring of power, "I feel thin, sort of stretched, like butter scraped over too much bread." This film is like too much butter on a small piece of bread.